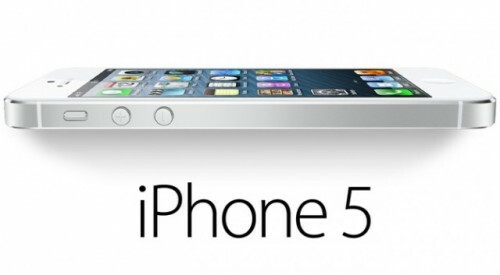 The huge strength of the Apple iTunes store is that it features a vast array of apps in virtually any category. Photography is one of the most popular iTunes categories, and with good reason. We’ve already done a very comprehensive post about some of the hottest photography apps on iTunes, but they were all mostly of a serious nature. That got us thinking, though: What about the funny photography apps for when you’re in a silly mood? Even if you think that gadgets and other devices are your forte, you should always make room for hilarious photography apps on your iPhone! With all the wonderful choices on iTunes, you’re really doing yourself a disservice by not downloading some of these humorous apps. After all, everyone wants a good laugh every now and then! We’ve scoured iTunes far and wide to bring you apps that can “cartoon” your photos, turn them into LEGO masterpieces and even put your face in the most unexpected places where it has no business being! You’re definitely not going to find any of your standard, run-of-the-mill editing and cropping apps on this list. 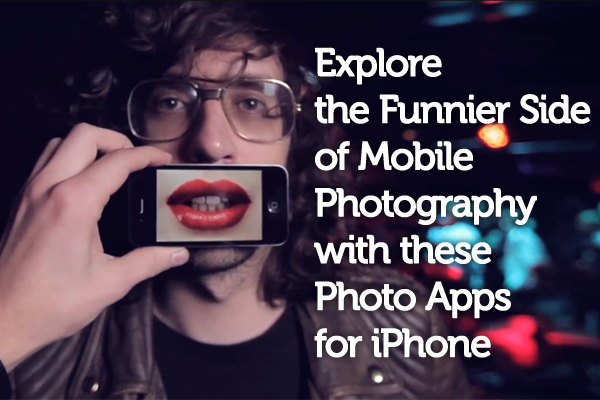 Get ready for the funnier side with these photo apps for iPhone! What could be funnier than actually turning your snapshots into toon versions of reality? You don’t have to be a cartoon fan or overgrown kid to get the most out of this app! 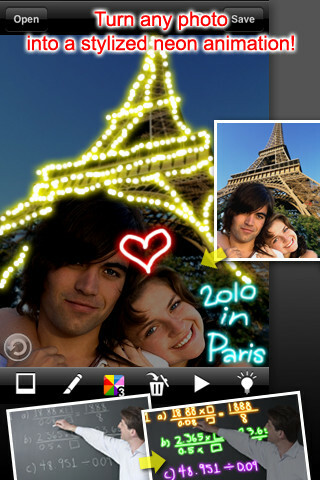 ToonPAINT gives you the chance to come up with cartoon-type paintings of your original photos! Cartoon your image so it becomes surreal. Want to make your guitar look all “tooned” out? Want to make something as ordinary as a wave appear as though it’s bouncing off the pages of a comic book? Done! Being a talented painter or drawer isn’t a prerequisite for using this app, thanks to its MagiSketch feature that lets you immediately go to coloring in your pictures. ToonPAINT is also way more than just your ordinary image filter—it’s a smart-painting app urging you to unleash your inner creativity all without having to spend a dime on art classes! Groovy! Take a psychedelic trip back to the 1960s, this time without being under the influence of any substance, with Photo Tropedelic. This funny app lets you really trick out your photos by turning them into veritable masterpieces of 1960s’ Pop Art. Now’s your chance to make all your snapshots look like you’re viewing them through some funky filter or how you’d see them if you were spaced out! What could be groovier than a giant bunny running toward you? Psychedelic, baby! Yet this funny app is so much more than just adding some memorable effects to your pictures. It’s actually quite sophisticated: It uses advanced image processing methods to evaluate your original pictures and then transform their lighting, colors and textures into psychedelic Pop Art offerings. From creator Larry Weinberg, Photo Tropedelic sells for $1.99, but can you really put a price tag on awesome psychedelia? We don’t think so! Some people may even think that you used very complicated photographic techniques to get the hilarious effects that you did from this app. How many times have you wanted to insert a picture of yourself in photos where you weren’t ever present? Many of us have wanted to do so at one time or another, just so we could enjoy a good laugh at the ridiculousness of it. Now, thanks to PhotoChop, you can. Oh, no! Doesn’t he see that tiger right next to him?! If you’ve ever thought that your pictures just don’t boast enough excitement, that can be solved with a bit of chopping action. This app lets you chop yourself or any subject out of an ordinary picture and then efficiently paste yourself into the thrilling background of your choice! The possibilities are practically endless. 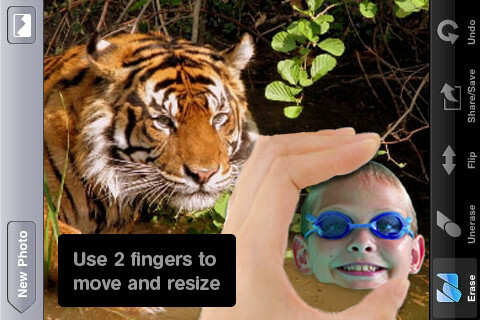 Want to paste yourself in a picture of a tiger, so that it looks like you’re about to get eaten? Check. Want to paste yourself in a picture that features a hot girl with whom you’ll usually have no chance, so that it looks like she’s giving you a kiss (as if!)? Double check! With a name like LEGO Photo, this app makes it easy to guess what it’s all about. 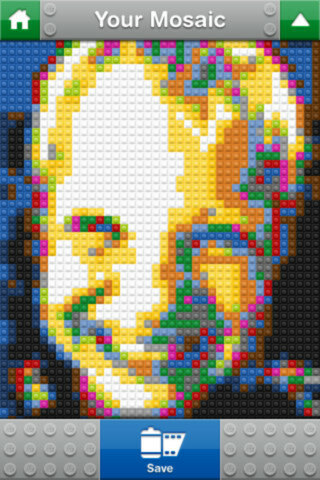 Basically, if you want to see what you or anything you take a picture of looks like in LEGO bricks, then this is your dream app come true! You can transform any picture into a hilarious LEGO-mosaic snapshot that will have your friends scratching their heads. Just think…you could look like this, too. Another thing LEGO Photo has going for itself is its ease-of-use. There’s no multi-stepped process here; just point your iPhone, take a picture and then see the LEGO transformation occur. As the transformation happens, all the LEGO bricks fall into place with a neat “clinking” sound. To get the best results from this humorous app, be sure to shoot your photos at close range, preferably against a background that features solid and light colors. This funny app comes with a coffee-influenced twist that you’ll love if you like humor, photography and coffee all rolled into one memorable app. Its inspiration is the bubbles that you see on the surface of your morning cup of coffee! 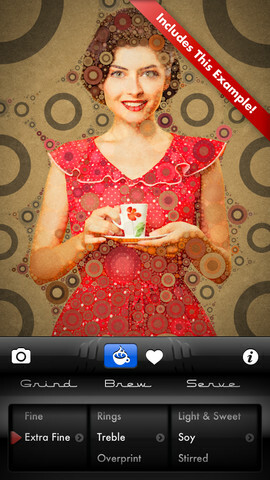 Percolator, aptly named, brings a bubbly and humorous touch to any of your pictures. Note the sweet bubble effects! You can turn your snapshots into mosaic-like masterpieces, but the main difference is that bubbles instead of squares are used to achieve this pleasant effect. The best part is that this app actually features many different brews, all with their own, unique appearance. Playing with your photos in a funny method just got a whole lot interesting. It may not be surprising that Percolator’s already attracted favorable press from various sources. Macworld and the New York Times have both written favorable reviews on Percolator, which will cost you $2.99 to download. Fans of anything neon will rejoice at this humorous app that turns your iPhone into a glowing photography device. Any photo you’ve ever taken can be transformed into neon animation that’s highly stylized, too. You ever wanted to go crazy on your pictures with glowing and neon doodles? Now’s your chance! This is a neon explosion to give your pictures a humorous twist. You can add insane decorative touches as well. For instance, go crazy when adding Christmas lights, fireworks and even jewelry…yes, jewelry. A bonus feature makes this app stand out among the rest: You can even playback your neon drawing one stroke at a time, taking in your masterpiece again and again. While some people may say that neon anything is a bit kitschy, you know better. A neon explosion in your pictures is humorous and fun. Neon Motion is available for only $0.99 per download. We’ve looked at all sorts of wacky and crazy effects for your pictures that will make you laugh out loud, so the natural conclusion is to feature an app that transforms all your pictures into masterpieces of digital cubism. 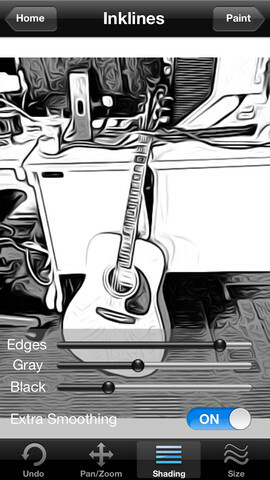 You don’t even need Picasso for this app…it’s that easy! With 15 various 3D templates from which to choose, you’ll stay busy for a while. Picasso has nothing on this digital cubism! If you can’t get enough of absurd, abstract and geometric shapes, then 3D Photo is what you’ve been looking for all along. Suddenly see your face “shattered” into numerous 3D fragments, and gain a larger appreciation of how cubism morphs anything into absurd patterns, textures and colors. For user convenience, touchscreen controls are provided, making use of basic movements like swiping and dragging as the basis for all nifty 3D effects. 3D Photo is available for download for $0.99. You’ve heard the old saying that a picture says a thousand words, right? Well, sometimes…it really doesn’t, which is why you need a hilarious app like Typic. Sometimes, you just have to use words to get the message across in dry, sarcastic fashion…just in case it isn’t clear enough. Typic can help you do this. You’re kidding? That door’s really…closed? This app lets you incorporate text over your pictures, giving you total freedom to choose the font, opacity and size that you think is best. 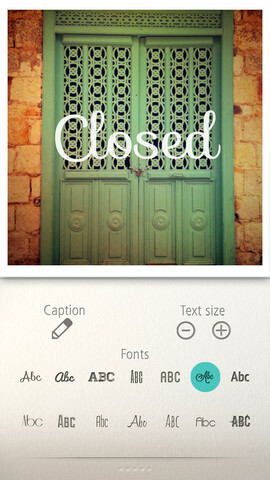 Just move the text with a swipe of your fingers, and pick the frame and color that appeals the most to you. Unfortunately, you can only pick from beige, white and black, though! So you want to point out the obvious like typing “closed” over a picture of a shut door? Go for it, Captain Obvious! 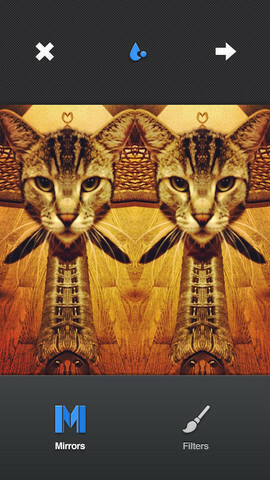 If you’ve ever thought that symmetry was beautiful, then Mirrorgram knows exactly what you mean. Of course, symmetry can also be extremely comical, such as having two faces side by side. 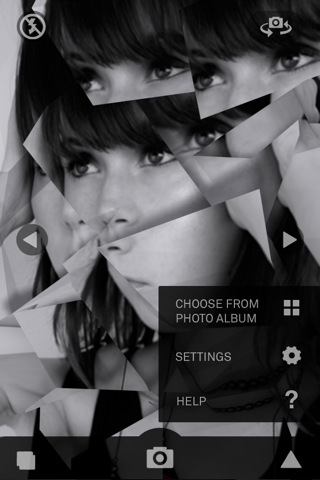 Mirrorgram is the app that empowers you to come up with interesting, mirrored images in a super-simple process. Here’s how it works: Just pick some photos from your own library and edit them according to the two-faced possibilities of Mirrorgram. Alternately, you can also utilize the live and in-camera feature in order to mirror the world around you as it appears—in real time. The options keep getting better, as you can also incorporate artistic filters and then share your comical Mirrorgram creations with everyone on Twitter, Facebook, StageBloc and Instagram. As far as funny photography apps go, Phofinity may well be on top of the mountain as far as pushing the wackiness is concerned. It uses the picture-in-picture feature and maximizes it for all that it’s worth. If you’ve ever wanted to really simultaneously bug or impress your friends with some really eye-catching PiP compositions, then Phofinity should keep you busy for a while. 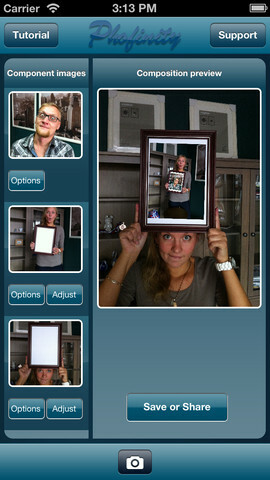 Just take a series of photos or upload them from your library, and this nifty app will do the rest for you. It’ll keep embedding one photo into another until it gets the final masterpiece that’s really going to be worth looking at (not to mention possibly make your eyes pop out). When you’re done, save the pictures to your iPhone or share them with more people on Facebook. This is truly picture-in-picture madness. Are you up for creating something that will have your friends doing some serious eyeball yoga just to keep up with the zaniness? Then Phofinity is what you want! Laughter is the best medicine, and now this proverb extends right onto your iPhone with these ingenious, humorous photography apps. If you’re a serious photography buff, then take a break from all of the countless serious photography apps out there. Instead of worrying about cropping, editing and adding sharpness to your images…unburden yourself and focus on “cartooning,” chopping, “LEGO-ing,” and cubing your pictures for a change! Want to make everyone think you’re a child of the 1960s and into psychedelia? 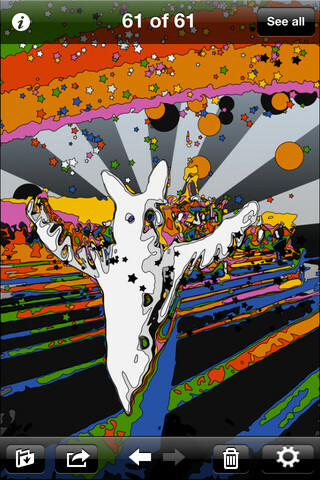 Then grab the Photo Tropedelic app. Have a taste for coffee and mosaics instead? Then download the Percolator app to show people how you’ve turned your pictures into bubble-inspired mosaics just for the fun of it. Are you attracted to neon flashiness? Then try the Neon Motion app and ratchet up the kitsch tenfold to create some truly funny results. What about you? Do you have any funny photography apps that we didn’t include in this list? Have you ever tried any of these apps featured here? If so, leave us a comment and tell us all about it! And, as always, feel free to share this post with your friends, family and complete strangers to share the photography love with everyone around you.